The stakes have never been higher for Virgin Galactic. Richard Branson's quest to send tourists into space took a tragic turn last week when SpaceShipTwo broke apart on a test flight. Today, in the lobby of Virgin Galactic headquarters sit two books. One is for pilot Peter Siebold, who survived the incident. The other is for co-pilot Michael Tyner Alsbury, who died. In the books, and on the lobby's walls, are notes -- like this one from June Scobee Rogers, the wife of an astronaut who died in the 1986 Challenger accident. "The setback is tragic, but the courage and commitment of your fellow team will soon help you all to recover, and from the energy of grief, the phoenix will arise with even more resolve and commitment," she wrote. While Virgin Galactic and Scaled Components, a division of Northrop Grumman (NOC) and the contractor that operated the test flight, reflect, they're also moving forward. Virgin is focusing its attention on a second model of SpaceShipTwo, which has the potential to become the first commercial passenger spaceliner. The 60-foot-long craft would lift passengers just past the edge of space, where they'd be allowed to unbuckle for about six minutes of weightlessness before being transported back to earth. It has been under construction for about two and a half years and is 90% structurally complete. 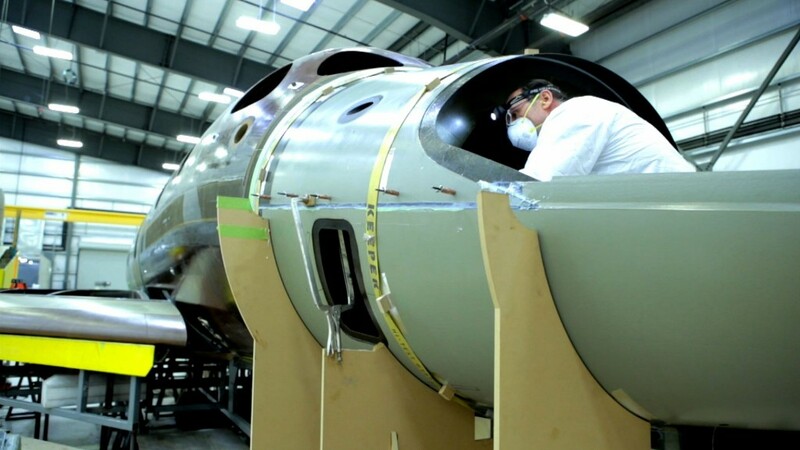 "We're going to take our time, make sure that we build this vehicle carefully, strongly and safely," Virgin Galactic CEO George Whitesides told CNNMoney. He said the company is confident in its technology. "We fly every day on airplanes that have had accidents," Whitesides said. "You do that because you know that fixes have been made -- that those vehicles are improved over time. That same thing will happen here." While federal investigators try to figure out the causes of the SpaceShipTwo disaster, the company says it has the green light to continue work on the second model. It could be ready for testing in "maybe five to six months," Whitesides said. "The early results of the investigation suggest that we'll be able to figure out any potential fixes and that they will not imply serious changes to the air frame," Whitesides said. The National Transportation Safety Board has ruled out issues with the engines and fuel tanks, and is apparently looking into whether the feathering system, which is designed to slow the spacecraft, deployed prematurely. "Clearly, our No. 1 job right now is to understand what happened and to make sure that it doesn't happen again," Whitesides said. That said, Virgin Galactic is very aware of the risks to test pilots. "There's a reason why test pilots are respected as some of the bravest and toughest people in the world," he said. "It's because they put themselves willingly into risky places so that they can make things safer for other people to fly later." The risks are worth it, Whitesides said, because Virgin Galactic's advances aren't just about giving the wealthy an impressive view. "Space is important to all of our futures," he said, citing examples like advancing technology for GPS and weather satellites. "At the end of the day, one of the things that I think is most powerful is that we'll be able to get a new perspective on our planet as hundreds and eventually millions of people are able to go into space," Whitesides said. That's the vision the Virgin Galactic team is focused on. "I think it's important that people know that the dream is still alive," he said. In that spirit, the second craft has picked up a nickname in recent days: Hope. --CNN's Rachel Crane reported from Mojave, Calif. Gregory Wallace reported and wrote from New York. Cullen Daly contributed to this report.